Hazy dark amber/brown colored brew, ruby against the light, with a modest white head that subsides to just a ring but does manage a bit of lacing. The aroma is complex - plenty of malt and yeast with something like raisins or dates, overtones of vermouth, vanilla, bourbon and alcohol. The taste is also complex - sweet malty, fruity base with obvious alcohol and touches of vermouth, bourbon and bitters. Full bodied, with decent carbonation and plenty of alcohol warmth, almost a winter warmer. Overall, something a bit different, potent, and, to me, enjoyable. Definitely worth a try, especially good for a cool fall or winter night. PACKAGING: 650ml bottle. Brown glass. Mostly white and black label. Unbranded silver pry-off crown cap. No neck or back labels. 13.70% ABV. 2015 vintage (or earlier?). 13.70% ABV. 150 cases bottled. "Quadrupel ale with 75% aged in rye whiskey & vermouth barrels." Served chilled into a goblet and allowed to come to temperature over the course of consumption. HEAD: About 5cm wide. Pale khaki in colour. Not real robust or creamy like Rochefort 10, Westvleteren 12, and St. Bernardus Abt 12, so I'm skeptical. But it has a decent enough consistency in spite of how relatively thin it is, and while it's not as coating as the heads seen in the style's best expressions, it's not off-putting. Retention is also decent - about 5 minutes. Leaves no lacing as it recedes. BODY: Deep ruby. Translucent and vibrant when held to light; it's a glowing colour. Semitransparent. I see no yeast/lees particulate within. Appears aptly carbonated. It's not amongst the best appearances for a quadrupel I've seen, but it's certainly above average - especially for an American-brewed quadrupel. AROMA: Sweet and boozy, evoking notes of warm marmalade, marshmallow, a boozy martini (I guess that's the vermouth), heavy residual sugars, booze-soaked oak (I guess that's the rye whiskey), and heavy amber malts. Yeast character does have a slight Belgian bend to it, but overall attenuation seems low even for a quadrupel. The barrel character is all booze and no nuance; I find none of rye whiskey's signature spiciness, nor do I detect any whiskey characteristics like vanilla, smoke, or peat. Any recognizable oak gets eclipsed by the heavy ethanol aromatics...and this is aged at least a year? Aromatic intensity is high on account of the alcohol heat. Dark fruit-wise, all I pick up on is some grape. There is some brighter fruit, which seems jammy. TASTE & TEXTURE: Jammy indeed, both in terms of the indistinct bright fruit and in terms of its texture, which is sticky. No dark fruit here, really - why brew a quadrupel, then? Sweetness is high but not egregiously so - though still, it's too much even for a quadrupel; I can't tell if it's overmalted, uses inappropriately attenuated yeast, or both. Speaking of the yeast, I don't find the heavy esters (e.g. the abovementioned dark fruit) you'd find as a byproduct of proper Trappist yeast strains. I will say it's nicely creamy, and the jamminess is nice in spite of being off the mark in terms of the style. Certainly not balanced, but the imbalance isn't egregious. It is shallow, and I wouldn't call it simple but it does lack the masterful subtlety and intricacy of the finest expressions of the style. Barrel character is wanting, to say the least. The best expressions aren't barrel aged (arguably), and when they are they use plain old oak. This gains nothing for having used vermouth and rye whiskey; indeed the rarity of vermouth barrel aging makes it immediately suspect as gimmickry. Though not as boozy as the aroma suggests, it is indeed uncomfortably warm, failing to disguise its ABV as well as its superior Belgian brethren. Rye whiskey warmth works well in some barleywines and imperial stouts; it doesn't work well in a quadrupel - or at least it doesn't in this one. And, as noted in the aroma, the rye whiskey isn't showcased all that well to begin with (lacking rye's signature spiciness, for example) - but then would spicy whiskey really accentuate the best in a quadrupel base beer anyway? Rye whiskey sits uneasily next to the lackluster base beer, never merging seamlessly with it, but not eclipsing it either. Vermouth barrel wise, I suppose it is a bit herbal in flavour, which isn't necessarily a bad idea if you want to play with style conventions in a quadrupel. But is the booziness that comes with vermouth worth it, and why vermouth anyway? I'm trying to see what the brewers were going for, and I'm having trouble. The herbal liqueur bend in the third act leaves the drinker with something of a foul martini aftertaste. This really doesn't work well at all. Getting back to the mouthfeel, it's smooth, wet, light to medium-bodied, and oddly thin. I've mentioned this is boozy a number of times, but it bears repeating - and that's with a year of age on it. To its credit, it does come close to the velvety softness you'd expect in a great quadruel. OVERALL: I applaud innovation, and this is the first vermouth barrel aged quadrupel I've encountered. But what the brewers are after with this is unclear, and the result is a boozy brew which lacks the dark fruit flavours and Belgian intricacy expected in paradigms of the style. I wouldn't recommend this to others, but it's not terrible. As a final note - why put a 13.75% whiskey barrel aged quadrupel in a 650ml format? I imagine the margins are higher, but that comes at the expense of the beer, which is better suited to a classic 330ml bottle. Hazy, dark copper/orange colored body with a decent head; nice sheets of lacing on the glass. The aroma exudes rye whiskey and caramel; spicy. Big malt flavors with a heavy sweetness; caramel, rye, mild wine undertone (the vermouth? ); raisins and dried apricots. Medium-heavy body; smooth and velvety mouthfeel; semi-dry. A very smooth, luscious, and heady brew. There's an even-keeled fullness throughout with lots of boozy, malty flavors swirling about. Excellent balance and depth of flavor packaged with an almost light-for-style feel that just makes this big beer very easy to sip and savor. Highly recommended! APPEARANCE: A deep, murky, mahogany color with nearly no head at all, just a few wisps on the surface that seem to be gravitating towards the center and the edges of the glass. This looks a lot like a good Barleywine. SMELL: There is a lot going on in the nose here. I don’t know that I’ll be able to sort it all out, but in no particular order I’m getting: raisins, dates, banana, brown sugar, sweet vermouth, is that plum? and some other dark fruit flavors, but a light does of that dark fruit. TASTE: Again, there is a ton going on here. Most of the aromas have made it to the palate, especially that brown sugar and caramel. The barrel comes through much stronger in the flavor as well, some oak and a fairly large presence of sweet vermouth builds as the beer warms. The banana is also pretty intense, but the raisins and dates, while still present, have subsided a bit. Oh, and that brown sugar is everywhere! The nice thing is though, all the sweeter flavors are forced to do a nice, little balancing act from the middle towards the end of the sip with a pretty reasonably strong, bitter hop presence. MOUTHFEEL: Wow this is an intensely rich beer, enormous body; sweet and full of flavor. 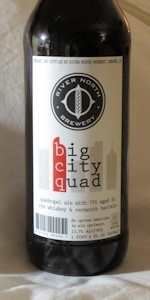 Unlike a lot of other River North beers that tend to have a drying finish, there is nothing dry about this (although it pulls back, just short of being cloying). This is like chocolate mousse…oh, I can only have one bi…and it’s gone. OVERALL: I’m not sure I’ve had many more complex beers than this. There are flavors and aromas from all over the place here and I’m sure I am currently tasting a few that I just don’t have a good enough beer vocabulary to articulate. This is a beer to sip slowly and savor, a perfect finish to an evening after a big meal. Despite all the richness and sweetness, however, I am impressed by the balance. There is just enough hop character to balance the malt and just enough dryness to pull the sweetness back from the edge. And while the parts are all fantastic, this is an excellent example of the whole being greater than the sum of the parts.